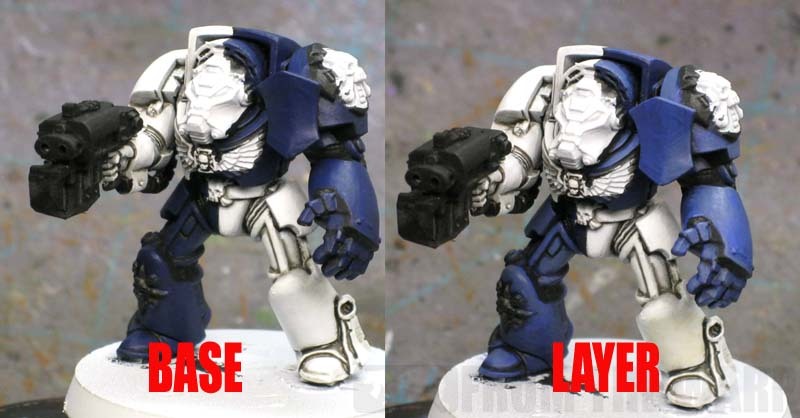 Here's the process I use when painting my Novamarines and any split or quartered color schemes. I've actually painted two test models now, but this tutorial is going to focus on the first one. 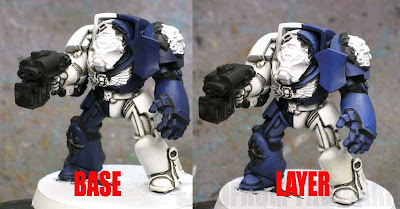 The difference being the use of white armour vs bone colored armour against the blue in the color scheme. You can switch from white to bone easily enough. The process is the same as how I paint my Deathwing models. That tutorial for bone armour is here. 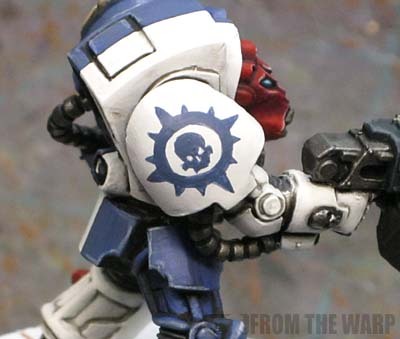 You might see this banner a little more in previous posts as I go through and make sure my older work is compatible with the new GW paints. If you don't see it, don't worry... the tutorial will still work. Your results may be slightly different in the end. Of course if you're using other brands and such, you may have additional differences. I tell everyone it's worth doing a test model so you can see how something looks in your hands before jumping in with both feet and painting away. I start with the lighter color of the two. Traditionally, your darker colors are more opaque and cover lighter colors easier. If we start with our lighter color, we'll probably have less trouble trying to cover it up as we add our second, darker color to the model. That means this guy starts with the white armour. Remember, you can skip the white portion of this and use the bone tutorial if you want bone colored armour. Just pick back up with the start of the blue armour and follow along from there. Start by priming the model white. Follow that up with some touch-up work as needed to make sure you have a nice, smooth coat of paint on there. That will give you a solid base to work with. The next step is to shade the white. Hands down, the best way (read: quickest and easiest) is to use Secret Weapon minis Soft Body Black Wash. Apply this to the recessed areas of the white armour and allow to dry. Don't worry if you get any on the armour plates as you can clean it up easily once your shading is dry. 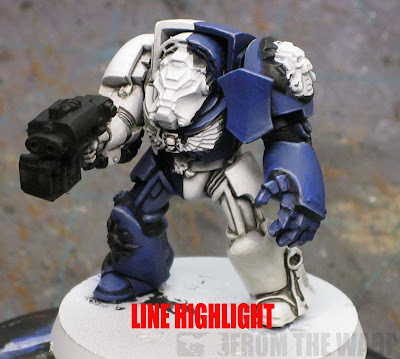 The white is finished off by cutting in the blue armour with black paint. I also hit all the metal areas at this point too. Now you need to start being careful because the white is done at this point and you don't want any stray marks. I'll be using the names of the new GW colors from here on out, but this tutorial is backwards compatible as well. If you've got the old colors, it will work all the same. The blue starts with a base coat of Kantor Blue. You can leave the black showing in the deepest recesses where it looks good. Once that dries, it's a zenithal layer of The Fang. This covers a good portion of the blue areas are really provides the majority of the color of the armour.You'll end up with the Kantor Blue showing only near the undersides and the recessed areas right next to the black. The final touch to the blue potion of the armour is a fine line highlight of Fenrisian Grey. You don't need to do all of the edges though, just a couple of upper ones to break up the armour plates. And that completes the basic armour. 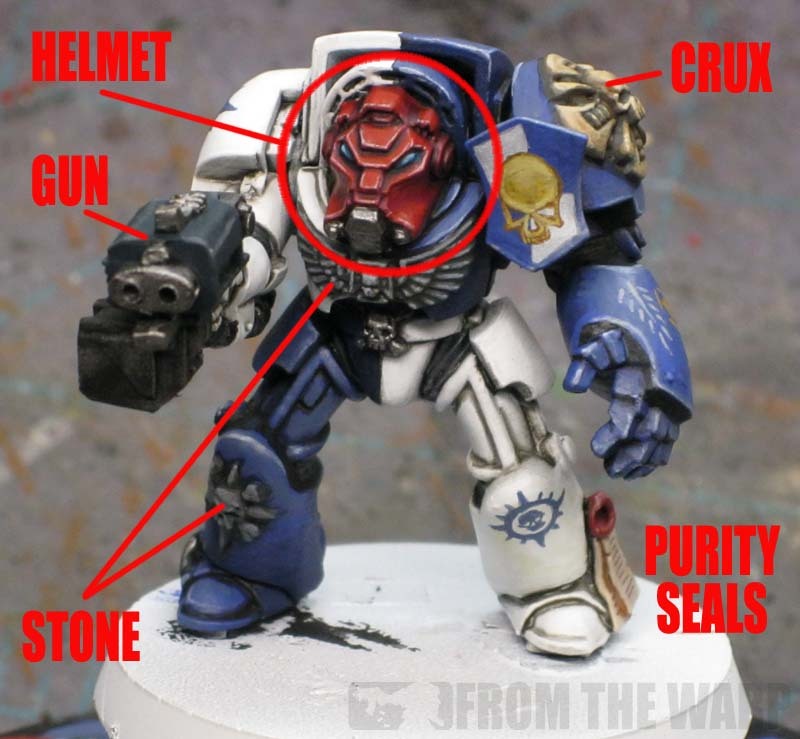 The rest of the model is done to taste when it comes to things like purity seals, storm bolter casing, metals, etc. I'm going to include the formulas I used on my model here for those who want to replicate it. The helmet: Basecoat of Mephiston Red. Then a series of 3 shades: Carroburg Crimson, Agrax Earthshade followed by Nuln Oil. Once each one of those dry it's a highlight with Mephiston Red again on the upper helmet plates. A fine line highlight with Ushabti Bone along those upper plates really defines the helmet. The eyes are done with Sotek Green followed by a small highlight in the center of the eye with Lothern Blue. This gives them the glowing look. The storm bolter: The gun is painted with P3 Cold Steel and washed with Nuln Oil. Actually, all of the metal on this model is done that way. The bolter casing is painted P3 Coal Black and highlighted with Mechanicus Standard Grey. The stone pieces: They start with a base coat of Stormvermin Fur and get a quick shade of Agrax Earthshade to darken them down. Oh how I miss the old Charadon Granite already. It's two line highlights after that. The first of Mechanicus Standard Grey and then a Brand-X light grey color. You could probably use Administratum Grey for the final highlight. The terminator crux: This too starts with a base coat of Stormvermin Fur and gets a quick shade of Agrax Earthshade to darken it down. The it's a layer of Baneblade Brown over the majority of the crux followed by a highlight of a Brand-X tan color. Kislev Flesh would probably work here. It's one final edge highlight with Ushabti Bone and a shade of Seraphim Sepia to tie it all together. The purity seals: These start as a base of Rakarth Flesh and get a shade of Reikland Fleshshade. A highlight of Ushabti Bone finishes the parchment off. The seal itself is Mephiston Red with a shade of Carroburg Crimson. If you're going to add text to the parchment, I'd suggest thinned Stormvermin Fur as black is too high of a contrast. The one last thing I have not covered is the ribbing between the armour joints at the knees, hips and elbows. It's a base of Mechanicus Standard Grey with a shade of Nuln Oil. Easy as that. Since I don't have a decal yet (I will soon), I had to freehand the design onto the shoulder. Like everything else, it's not too hard if you break it down into more manageable shapes. I use a fine detail brush and some thinned Kantor Blue to do all the work. I start by drawing a circle big enough to fit the shoulderpad. From there, I thicken it slightly and clean it up. I add the outward spikes next starting with the compass points first. Top, left, bottom and right. Get those for on and then you can fill in the smaller ones in between those anchor points. The skull is painted inside the circle first without any thought to the eyes or nose holes. I'm just going for the shape overall. Once I have the shape I want, I go back in with white and add the eyes and nose. If I get those wrong, I clean up their shape with some Kantor Blue again until I like what I have. I'm not going to get into the process here as folks can weather and base in the style they prefer. This will get you a model that is all set and ready to go. I will say that taking the time to add some weathering and such will really bring the model to life and tie all of the elements on the model together. thank you so much for this! i was the one who originally asked for this and have been eagerly awaiting it ever since, and i can safely say that it is going to be a massive help. the best part is that it is obviously going to be easily transferable to other models and even tanks with relative ease. thanks again. For the stone effect I have been using standard mech. Grey (gw) with a wash of babda black then drybrush it longbeard grey for a similar effect. Love your blog!!! Thanks for the brilliant tutorial, clear and very easy to follow. And just the nudge I need to crack on with some painting! Atreides: Thanks for asking about it. And yes, the process should scale up easily to dreadnoughts and tanks. Just keep the same sequence and you should be fine. Anonymous: Thanks! I might have to try that for a grey stone color. I worry that the Nuln Oil (Badab Black) might kill the color too much though. I try and stay away from using it unless I'm working with metal or very deep recessed areas. for me the standout on this guy is the helmet - i think it looks fantastic. I've always been wary of highlights that are a radically different colour (as you've used bone here on the red) but i'm working up to try it. I've taken to splitting the colour on my terminator cruxs to doing the cross as a stone effect and the skull as a, um, skull colour, which i'm pretty sure i first saw somewhere on FTW! Nice tutorial, Ron. Thanks for posting it; it's very helpful! This is possibly the best painting tutorial you have written to date. Well done Ron! I particularly like the approach to white, I just received my Secret Weapon order of soft body black and hadn't considered using it for that. Will have to try that out. Matt Farr: Thanks. It is odd highlighting red with bone, but if you keep it really sharp and fine, it reads as a sharp, bright highlight. And a quick pass with Carroburg Crimson shade will always tone it down if needed. Clif Ganyard and Fayte: Thanks! keith: Thanks, but I don't know about this one being the best. The Soft Body Black is perfect for shading white. Just pay attention to your application and don't be messy... it will make it easier to clean up later on that way. How did you do the base? It looks like you took him off the base he was on and put him on a Secret Weapon miniature base. Or, is that your own green stuff creation? Jason Gross: Yes, the base is from Secret Weapon. I had it there and it was the first one I used in terms of trying to decide on a color scheme for the basing for the army. It doesn't look as good as it could since I didn't paint the edge on this one. 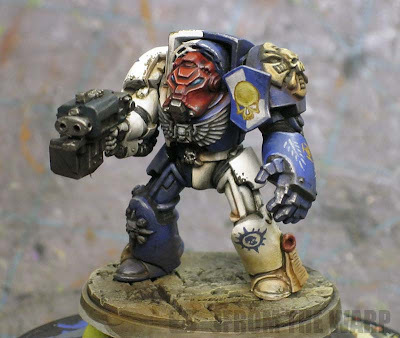 Excellent tutorial, very helpfull for doing this on an army scale rather than the individual model style i was using which was much more labour intensive. Looking forward to getting a force of these guys :) keep up the good work. Richard Rose: Thanks. This certainly does lend itself to an assembly line type approach if need be. Just work on a section at as time. The biggest thing is being careful when you get to the later steps that you don't get any stray marks on the white armour. These will look really sweet. Freehand symbols just never look as polished as a transfer. Given your recent dabbling with transfer, any reason you didn't use them? Also, what pattern will you be doing on vehicles? Will everything be quartered, or might you do a Rhino, say, mostly blue and then have the recessed panels in white, for instance? Gorgeous representation of the Nova Marines colors! ICs: Thanks! I think it looks better than the solid Ultramarine blue paint scheme I was going to go with. Ron, cracking work as always! The blue and reds look really nice - Hmm, this may make me sound like an idiot, but what exactly is a Zenithal layer? It should give you a good explanation of what a zenithal highlight or layer is. Excellent tutorial m8, question; how would one "mask up" a vehicle for the same process? Anon: Excellent question. The process is the same for vehicles and dreads. The trick is painting the white/bone areas first since they are the lighter color of the two. Once you have those shaded and highlighted, you can move onto the blue portions. Since the blue is darker, it will allow you to cut into the white/bone areas until you have a nice clean edge between the two colors. I will say that I'd be more inclined to make a vehicle one color (like the white/bone) and then add a stripe or accent panel with the blue instead of trying to quarter the vehicle. The reason I say that is for visual effect. Quartering a vehicle might look good, but making it one color with an accent will make it stand out from the troops more. If everything is "quartered," it no longer has any significance so to say.